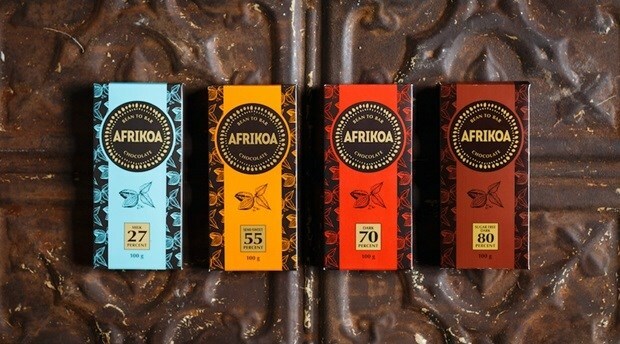 Out of over 12,600 products to be judged in a blind tasting, Afrikoa was awarded a 2-star Great Taste award for its 55% Semi Sweet Dark Chocolate, which means judges believe it to be ‘above and beyond delicious’. Less than 10% of products achieve a 2-star rating. The 55% dark chocolate was described by judges as being "A milk chocolate mouth-feel with a dark chocolate taste. The tart fruit notes balanced by the slight nuttiness and creaminess travel on and on. An eyes-closed moment to savour." Judged by over 500 of the most demanding palates, belonging to food critics, chefs, cooks, restaurateurs and producers, as well as a host of food writers and journalists, Great Taste is widely acknowledged as the most respected food accreditation for artisan and speciality food producers. As well as a badge of honour, the unmistakeable black and gold Great Taste label is a signpost to a wonderful tasting product, which has been discovered through hours of blind tasting by hundreds of judges. Great Taste values taste above all else, with no regard for branding and packaging. Whether it is vinegar, granola, bacon or cheese being judged, all products are removed from their wrapper, jar, box or bottle before being tasted. The judges then savour, confer and re-taste to decide which products are worthy of a 1-, 2- or 3-star award. Antonino Allegra, head chocolate-maker for Afrikoa said, “We are incredibly honoured to win in a category with so many fantastic chocolates from around the world – and on our first year of entering the Great Taste Awards too! For us, this is recognition that chocolate made in South Africa from African cocoa beans can compete with the best in the world.